Well, I knew the offseason would be slow, but this slow? Wow. There’s no mistaking it: Baseball really is a summer sport. I think all of us Twins bloggers are waiting to pounce on the much talked about potential trade that would send second baseman Brian Dozier to some team (possibly the Los Angeles Dodgers) in exchange for some player (possibly Dodger pitching prospect Jose De Leon). Other potential trade partners have been mentioned in recent weeks, but none as much as the Dodgers. And yet… there’s still nothing to announce. Checked further on potential #Braves fit for Dozier and source w/direct knowledge insists match w/#mntwins would be a "long shot." Meanwhile, we’re in the middle of a cold spell here in the Northwest, and I’ll immediately qualify that by saying it’s cold for the Northwest, not cold, say, for Minnesota. Temperatures here have recently fallen into the 20s and teens overnight, with daytime highs at, near, or slightly above freezing. Someone in Twins land is reading this and chuckling. I like to go for a walk sometime after dinner and before bed, but my Twins cap just won’t cut it in cold weather so that led me to purchase a Twins knit cap the other day. I’m still waiting for it to arrive. 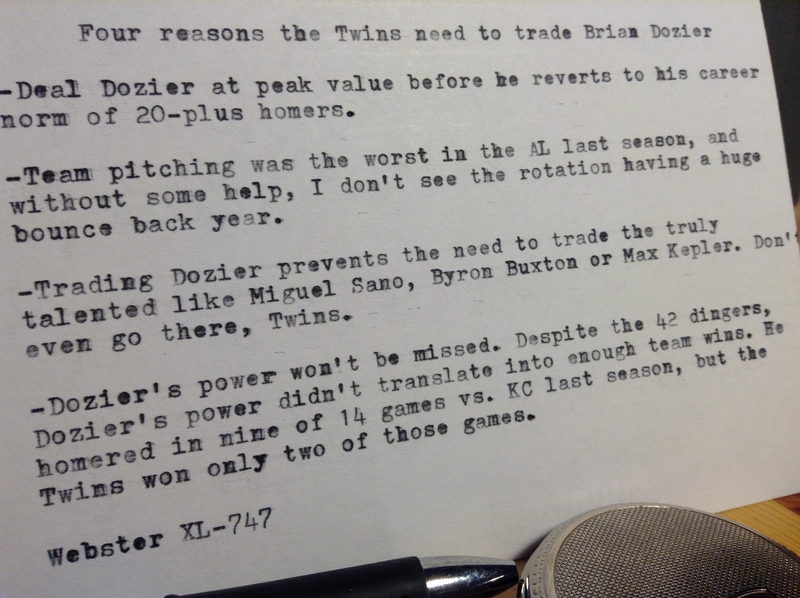 So… Falvey & Co. clearly are holding out for as many players as they can get for Dozier. Or, they have pulled back in fairness to him after all the headline speculation and will now bide their time. As much as we would like a deal to happen, it could happen at any time. But if Dozier starts the season with the Twins, and starts slowly at the plate like he has done before, then his value will fall until his bat wakes up again. He caught fire last season toward the end of June.